Sign-up list will be posted on front porch by 8 am every day of sale. We do not honor other lists. Credit cards accepted on sales of $75.00 or more with driver's license and 3% surcharge on purchase. For sales under $75.00, please be able to pay cash. ATM located 1 mile north of house at Plaza del Lago in Wilmette. Sorry, no checks. We reserve the right to refuse entrance to any person or persons, at our discretion - and to ask any person or persons to leave the house, at our discretion. No appointments this time. The tool department has moved to the 3rd floor ballroom, where there is plenty of space and light. The basement & garage are closed. Kindly come prepared to climb stairs! Research parking before you come. No parking in driveway. No help on hand for moving heavy objects. Not responsible for accidents or injuries inside the house or anywhere on the property. We've enjoyed getting ready for Sale #3 - and hope you enjoy your visit to this historic Georgian Colonial home commissioned in 1908 by Philetus Warren Gates (1857-1933) from Chicago architect Robert C. Fletcher, a graduate of Cornell University and former member of the Louis Sullivan achitecture fim. The family sponsoring sale #3 has lived in the house for 50 years and a family member will be present during the sale to answer questions about the house. Please note: there will be no Sale #4 - all of our possessions must find new homes by the end of October! A pair of (American?) stained glass church windows. Some condition issues - but on the whole, pretty impressive. In the first floor library. 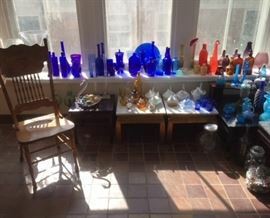 Colored glass in the southwest corner of the sun room. 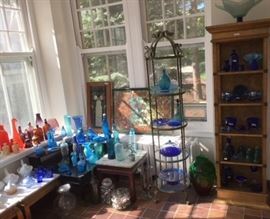 Vintage & ontemporary glass in the northeast corner of the sun room on the first floor. 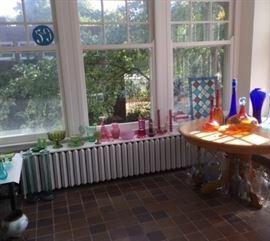 Artfully displayed by Ruth R. and Saing S.
Colored glass in the east side of the sun room on the first floor. Glass along the south wall of the sun room on the first floor. Asian, American, European & Middle Eastern objects in the dining room on the first floor. Eclectic. Inspiring. 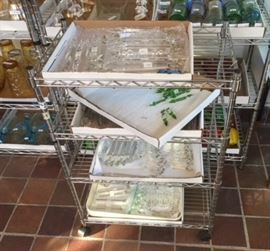 Four full trays of vintage crytal drops & etc. Individually priced. 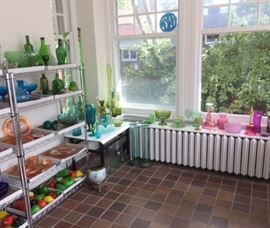 In the first floor sun room. 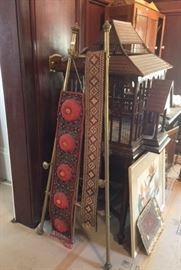 Asian & English (or American) beaded hangings on an antique brass easel in the dining room. 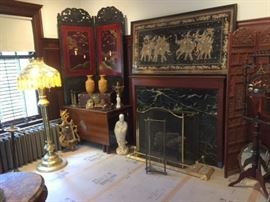 A view of the northeast corner of the dining room, showing a mid-century-modern Willet brand dining room table supporting an antique Japanese 2-panel wood & lacquer screen; two yellow Chinese ceramic vases inscribed on the bottom with the characters for "Wang Bing Rong," a famous Qing dynasty (1644-1911) ceramic artist; a large standing white Chinese porcelain figure; a tall standing Middle Eastern pierced & embossed brass lamp with unknown letters on the base and figural scenery in places; finally, a monumental, framed Burmese "kalaga" embroidery on the fireplace mantle. 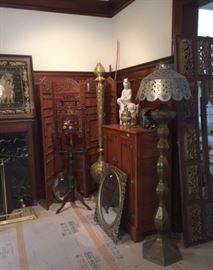 A view of the southeast corner of the dining room, showing a 4-panel carved wood floor screen, a bird cage hanging in a carved wood stand, a mirror framed in gilt wood, an antique ice box, and two tall, shapely Middle Eastern metalwork lamps. 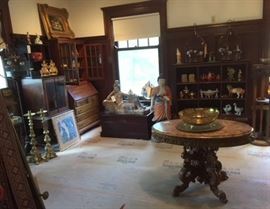 A view of the northwest corner of the dining room, showing massive antique brass candlesticks, a framed Thai or Cambodian print or rubbing, a pair of Chinese soapstone figures, a Japanese lacquerware tiered box, a vintage standing birdcage, a beautiful 2-part wood cabinet/desk ensemble, and so on. Detail #1 of the antique Japanese wood & lacquer folding screen in the dining room. Detail #2 of the antique Japanese wood & lacquer folding screen in the dining room. 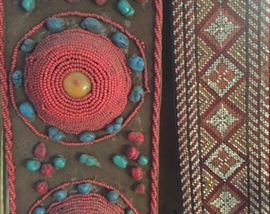 Detail of sequin work & embroidery on monumental framed Burmese kalaga - on the fireplace mantle in the dining room. Pair of yellow Chinese ceramic vases of unknown age with carved figural imagery. Inscribed "Wang Bing Rong" on the bottom. Wang Bing Rong was a celebrated Qing dynasty ceramic artist whose work was often imitated in the decades following his death. Detail #1 of the antique Chinese carved yellow porcelain vases in the dining room. Detail #2 of the antique Chinese yellow porcelain vases in the dining room, with characters for "Wang Bing Rong" on the bottom of one of the vases. The historic Wang Bing Rong, we wonder? Or an admirer who adopted his style many years later? Detail #1 of the tall, pierced Middle Eastern brass lamp in the dining room. Lamp was polished to a bright finish after present owner acquired it some decades ago. Detail #2 of the tall, pierced Middle Eastern brass lamp in the dining room, showing figural imagery. Detail #3 of the tall standing pierced Middle Eastern brass lamp in the dining room, showing unknown writing on the base. Could it be in Hebrew? Aramaic? Syriac? Amharic? Or something else entirely? Pair of small Chinese brass candlesticks in the form of 7-story pagodas. In the dining room. A Victorian bird cage with its original stand, in the dining room, next to an antique 2-piece wooden kitchen cabinet. Carved green Chinese soapstone bowl with lotus imagery. An elegant centerpiece in any room. A big, beautiful antique wooden letter box with 70 slots. Small, antique Chinese 3-footed brass censor with finial in the shape of a dragon or dragon-like creature. In the dining room. A pair of cranberrry glass lamps, in the pink bedroom on the second floor. Fantastic antique hanging globe with beveled glass roundels and colored glass jewels, all set in decorative brass or bronze framework. Recently cleaned and restored by Adams Electric of Wilmette. Illuminated by four small electric light bulbs located in the base. With extra-long chain/cord, for suspending in a spacious atrium. Hanging in the front hallway area. Rare antique glass ceiling fixture with vertically striated, teardrop-shaped globe in a pale blue-white color resembling milk glass. In flawless condition. since the 1970s it has been hanging in the back pantry on the first floor. Shown privately by request only. An appealing piece of stained glass. 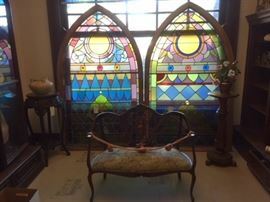 In the first floor sun room. 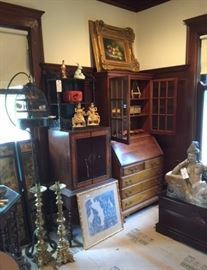 Chinese & Japanese white porcelain figurines, Chinese soapstone carvings, and other beautiful pieces. In the living room. Chinese white porcelain footed lotus bowls & a seated guanyin. In the library. Asian white porcelain figurines, Chinese soapstone carvings and wooden figures on display in the library. Beautifully shaped Chinese wooden stands for vases, teapots, etc. We have many sizes. In the library on the first floor. Two white porcelain carp, in the library. More white porcelain / blanc de chine pieces to be posted here soon. Chinese & Japanese ceramic and porcelain figurines. In the library. Yamaha C-7 Semi-Concert Grand Piano Satin Ebony, ca. 1973. Appraised on Sept. 6, 2018; copy of appraisal available at front desk of estate sale. Here is what the appraiser reported: Cabinetry: 90% / Costmetic Finish: 70% / Plating & Hardware: 80% / Veneer: 95% / Structure Back Assembly & Rim: Good / Plate: Good / Soundboard & Ribs: 90% / Pinblock: 90% / Whippens: 80% / Butts, Shanks & Flanges: 70% / Damper Felts & Levers: 50% / Felts & Leathers: 80% / Trapwork: 90% / Regulation: 80% / Tonal Strings: 70% / Hammers: 80% / Pitch & Tone Quality: 80%. Market Value: $8000-$10,000.00. Replacement Value: $20,000-$25,000. The pink bedroom on the second floor...wtih dolls galore. Doll house & dolls in the pink bedroom on the second floor. Vintage chest of drawers in the pink bedroom, with two vintage mirrors. On the second floor. More outfits for Jackie Kennedy doll, new in box. Contemporary Jackie & John F. Kennedy dolls. In the pink bedroom on the second floor. Still more outfits for Jackie Kennedy doll. Outfits for Jackie Kennedy doll, new in boxes. Kate Middleton & Prince William dolls. In the pink bedroom on the second floor. Vintage Gund Brand "Mini-Martian" dolls, some in their original boxes. In the pink bedroom on the second floor. We also have a Martian car in its original box. Plus some Susie Sad Eyes in their original boxes. Not on display. Ask Valerie at the front desk if you'd like to see them. Dolls of many cultures, awaiting new homes - in the pink bedroom on the second floor. Priced to sell. Madame Alexander bride doll (left) and Madame Alexander ballerina doll (right). Both in very good condition.